Peddlers are traveling Imperial traders on horses. They are usually found under attack, either by Forsworn in the Reach, or bandits elsewhere. 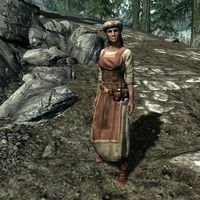 The female Peddler can only be encountered in the Reach, often in combat against the Forsworn. If you help her against her attackers and she survives, she will be grateful and offer her merchant services, saying: "Thanks for the help. The Reach has been crawling with Forsworn lately. It's a wonder people can get anywhere around here. Maybe I'll avoid this entire hold for awhile. That said... I do have a few things to sell." She wears a set of merchant clothes, a pair of boots, and a hat. Against her attackers she uses a leveled dagger (up to Elven quality at level 25). She carries all her purchasable items on her person, resulting in quite a catch if you find her dead or successfully pickpocket her. However, the wares are cheap and include three lockpicks (and a 75% chance of seven additional lockpicks), a 75% chance of some randomly selected common ingredients, and the same chance for some uncommon ingredients. There is also a 75% chance she carries a soul gem, either empty or filled, a 75% chance of some leveled arrows, a 50% chance of some ore, although you can be unlucky and get a piece of charcoal instead of iron ore before level 3. From level 3 to 6 it will be silver ore, from level 7 to 10 it will be orichalcum ore, and from level 10 to 13 you may find moonstone ore. Lastly, there is a 25% chance she will carry some ingots, leveled and ranging from cheap iron ingots at level 1, to rare and expensive ebony ingots from level 27. She always carries a bit of gold for transactions. 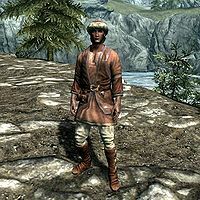 The male Peddler can be found all over Skyrim, usually battling bandits. When you have slain his opponents the happy Peddler will say: "I thought I was a goner just now. Thanks for the help, and if you need any supplies I have a few to sell." Like his colleague in the Reach, he wears a set of merchant clothes, a pair of boots, and a hat. Against his attackers he uses a leveled dagger (up to Elven quality at level 25). He carries his wares around with him, which includes the gold he has available for barter, along with all the items he sells. There is a 75% chance of up to five uncommon Ingredients, and a similar chance for up to ten common ingredients. He carries three lockpicks, with a 75% chance of an additional lockpick. He also has a 50% chance of selling the same random minerals as his female colleague above, and a 25% of up to two processed minerals. He also has a 75% chance of carrying a soul gem, either filled or empty, and also has a 75% of some leveled arrows (up to Dwarven quality at level 10). This page was last modified on 30 November 2017, at 13:26.